Vimeo has finally taken back the edge from YouTube! Up until now, YouTube has offer an excellent 1080p viewing for HD videos while Vimeo has stuck at 720p. Honestly, I had been disappointed with the quality of my last few videos on Vimeo. But, that is about to change! Vimeo just launched their 1080p viewing! 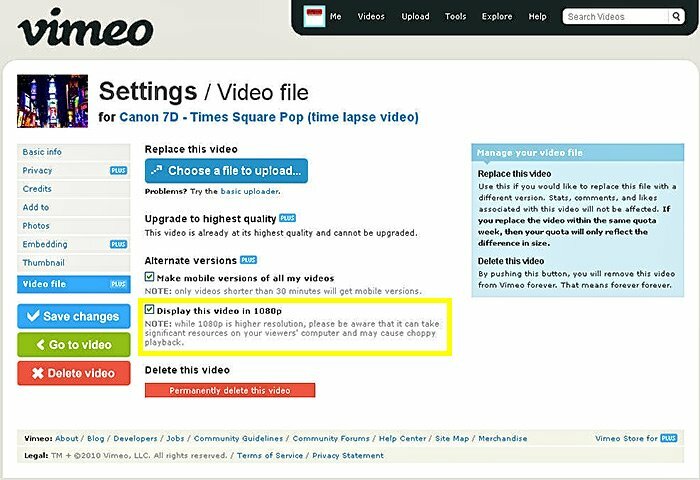 You will need to log into your Vimeo account and submit each video for reprocessing. It is not automatic. Click the Video File button and then check the Display this video in 1080p and click the Save Changes button to trigger the reprocessing. See the above screen. This option is only available for Vimeo Plus members. I have submitted these two HD Videos which were shot with the Canon 7D for 1080p processing. The sharpness has greatly improved (especially in bright tones like the white snow) and the Jpeggy muddy blockiness in the reds has also been reduced (overall improvement as shown in Times Square Pop). Let me know what you think.